Citizens in our deeply, angrily divided world desperately need peaceful and productive ways of relating to each other. 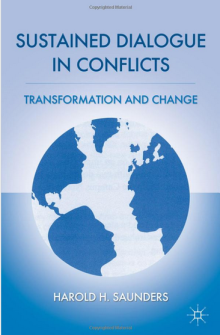 Rooted in four decades of intense experience in deep-seated human conflicts, Saunders presents a peaceful way of transforming destructive relationships and designing change. Writing from personal notes and verbatim transcripts, Saunders and his colleagues lead the reader through the experience and experiments that produced a powerful process for social, political, and economic change.